As Addi approaches 6 months we are planning for when he starts solids. Of course for when Addi starts solids we will need a high chair! So instead of paying over $150.00 I thought I would check eBay for any bargain buys. Sure enough after doing some research on the best brand and model of high chair I found one on eBay. I wanted a hi low chair so that I can use it at both the dining table and in the lounge room. Something that was easy to move around and of course clean. Since Addi isn’t quite right with sitting upright, a high chair that has different positions. 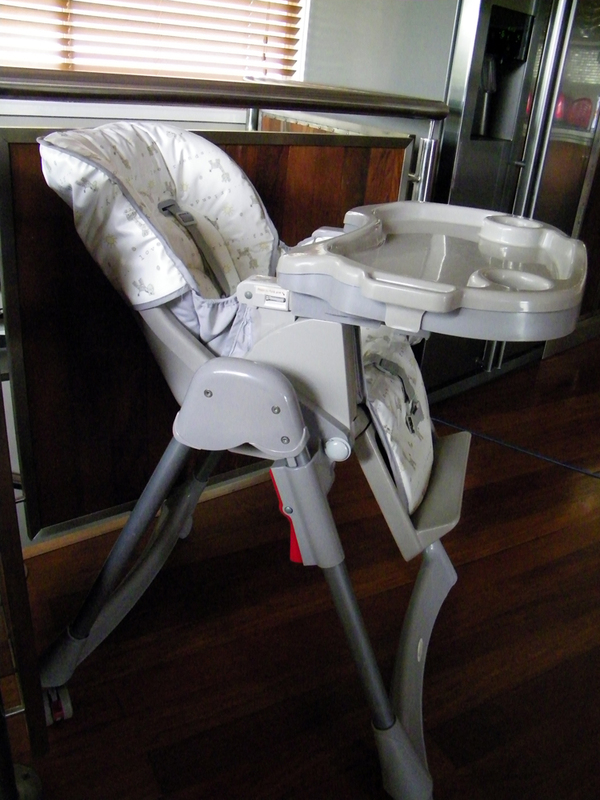 It is the Steelcraft Giraffe Hi Lo High Chair, that retails for $150 in store, I paid $33.00 second hand on eBay. Granted I had to go for a drive to north Brisbane to pick up and give it one heck of a clean, in my opinion it is still worth the time! I simply pulled the chair cover off and all the harness straps to soak them in some nappisan. I then washed the cover in the washing machine on hand wash with a little more nappisan and washing powder. Soaked the straps in disinfectant and then hung both out in the hot sun all day to dry. The chair itself I wiped down with hot, soapy water with disinfectant and cleaned it all up as good as new. I cleaned the two trays off using disinfectant then also washed them up in hot soapy water. I’m so happy with our purchase, it just goes to show that second hand is just as good as new if you are willing to put the effort in to clean it up!